Phillip Taylor is an educator of 18 years. He wrote the English portion of the IB application and developed the IB curriculum for the English A1 program at his school site. He currently facilitates ongoing action research projects to investigate ways to improve student performance on the school’s IB English examinations. He is currently investigating the efficacy of different feedback approaches as applied to groups of 100 – 150 students. 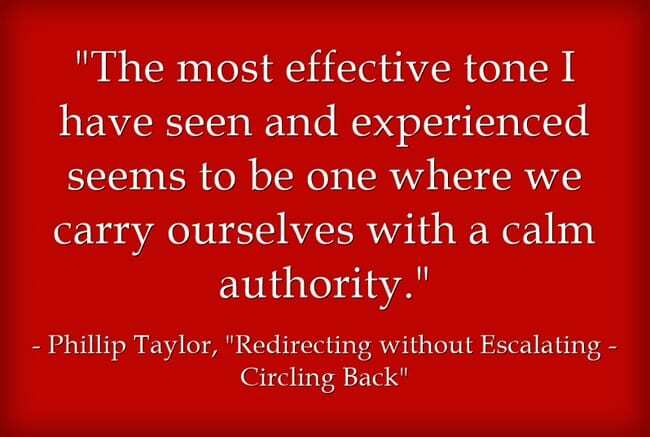 The second step in redirecting misbehavior without escalating is to “circle back.” We spoke at some length in our last article entitled “Redirecting Without Escalating” about how to redirect student misbehavior without getting into a conflict. The previous article introduced a strategy intended for students who have a tendency to prompt conflicts and to escalate simple redirections. These strategies are intended to redirect such students without allowing them the opportunity to turn a simple redirection into a verbal back and forth between teacher and student. In the last article, we ended with “the walk away.” This article picks up from there. A number of our students are conflict-driven. These students are not always going to stop misbehaving once we walk away. The “walk-away” is about cutting the conversation off before the student has a chance to start making a scene. 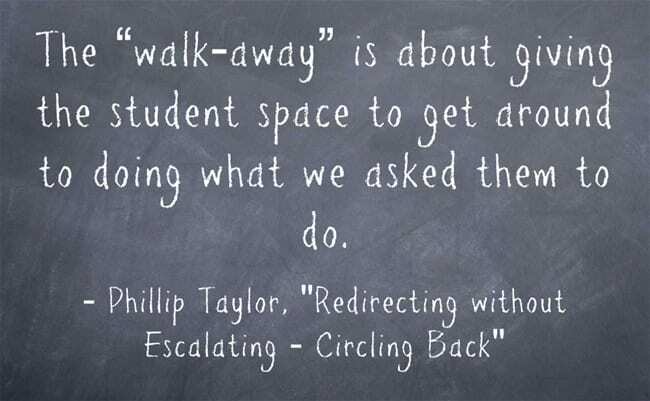 The “walk-away” is about giving the student space to get around to doing what we asked them to do. Sometimes such space allows a kid to save some face. Often, given space, the student is willing to get to work. Letting the student have the “last word” is often beneficial, but sometimes a wry side-comment upsets the entire learning environment. Thus, a pause is warranted here to determine if a statement can pass as a “face saving” moment for a student or if the comment is only the beginning of continued off-task behavior. The “walk away” helps provide such a pausal moment. I don’t believe a student’s pride needs to be leveled to become compliant. Nor should activity that seriously disrupts the learning environment go unaddressed. We don’t need to assume that we need the last word to gain compliance. If we remember, part of creating the right tone for avoiding escalation is to be busy. We are too busy for pettiness, so if students need to save a little face before they get back on task, we don’t need to get into petty exchanges about passing comments that don’t upset the learning environment. We can allow space for that, as long as everyone in the class is doing what they need to be doing. While I think it is important to ‘lay down the law’ I also believe it’s important to be authentic and keep the connection we made in the first redirection. My tone may be more serious, but I try to keep my language familiar. I want the student to choose to stay, I don’t want to have to send them out, but I have a job to do, and this is an unfortunate part of the job. I hope to convey this attitude with my approach on the second pass. The walk away is just as important here as in the last step, perhaps more important. I also find it is important for this second redirection to be faster. I should get in, say my piece, and get out VERY quickly to ensure that if the kid is going to try to save face and start an argument, I am already two or three desks away so I can pretend I didn’t hear it. I will also sneak up on the kid a little. I don’t want to make eye contact and let him or her know I’m coming, because the student will have time to prepare a retort. He/she knows I’m going to circle back. Thus, I want to be in and out of there before the student has a chance to prompt an argument. I should also talk about the importance of ‘tone.’ Tone is conveyed through body language, pitch and timbre of the voice, facial expression, and likely many other factors. It is important to be aware of and monitor our own emotional state, since our own emotional state influences this “tone” more than we are often aware of. The most effective tone I have seen and experienced seems to be one where we carry ourselves with a calm authority. Showing and expressing some frustration is often effective when the student is pushing things, but remaining calm and centered, even when having to express frustration, is far more effective than allowing oneself to become upset. My own research has shown that office referrals presented in a calm, matter-of-fact way are far more effective at addressing misbehavior than referrals given with extreme severity and dramatic displays by teachers. Dramatic displays by teachers tended to become a distraction from a student’s behavior, and students in my study perceived the teacher’s behavior as more problematic than their own in such situations. When teachers responded calmly and in a more centered way to misbehavior, the same students described their own misbehavior as the cause of the office referrals or consequences. Students who are given referrals in this calm and centered tone also perceived such consequences as reasonable and appropriate. Such students also showed evidence of adopting the calm teachers’ established norms as their own. Thus, I do not believe that restorative approaches to discipline mean we do not provide consequences. I believe that consequences provide clear instruction about boundaries. 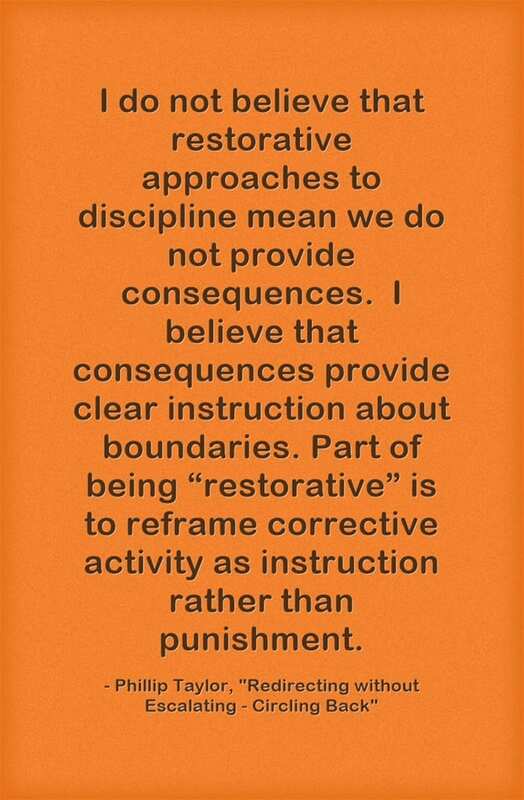 Part of being “restorative” is to reframe corrective activity as instruction rather than punishment. A calm, centered teacher who has developed rapport with students appears to reframe even an office referral with a clear consequence as a restorative act. Therefore, we must ensure that our own behavior when giving an office referral doesn’t “muddy the water” and that our conduct leading up to and into the office referral conveys the message that the student’s behavior that day is the cause of the action, and that we were sincerely hoping for a different outcome. Such behavior on the teacher’s part has been shown to clarify the educational purpose of the office referral for students. Thus this information about the importance of remaining calm and centered sets us up for the last article in the series, “The Explanation and the Office Referral.” So stay tuned my fellow teachers, and stay chill!